I kind of jumped on the Essie bandwagon a little bit late. I have always eyed up all the beautiful shades in Boots with the little emoji with heart eyes, but I have always been a bit reluctant about paying £7.99 when in my Boots store BarryM is directly opposite. What normally happens is I spend ages looking at Essie, I then turn around and realise I can get two beautiful BarryM shades for the same price, and well you can guess what usually wins. BUT NOT THIS TIME. I had a day off, it was Blue Monday actually, and I finally purchased my first Essie shade. This certainly brightened up ‘the most depressing day of the year’ I chose Naughty Nautical, since this is my favourite colour in the world and in the bottle it had little sparkly tints in it, and I just fell instantly in love. Unfortunately these little sparkles don’t really show up on the nails, but anyhow it is still an absolutely stunning shade. Application goes on like a dream, it has a slightly wider brush than BarryM polishes, designed for less brush strokes to be required when applying, I loved this feature so much! In terms of drying, it dried relatively quickly, but I then went to sleep soon after and I had the groovy fabric marks from my bed! This always happens to me because I do tend to do my nails quite late in the evening, so that is my fault! You never know, could be the next fashion trend! I am guilty of being a bit of a nail polish picker, especially if I am nervous or bored. But whilst wearing this I really tried to resist! I was SERIOUSLY impressed with how long it took for this polish to even chip a little bit. Please ignore my nail shape, for some reason my nails keep splitting. But this is what my nails look like after NINE DAYS, and the same has come off on this nail on the other hand too. I usually change my polish every 6/7 days but wanted to see how long this one would last! I have done all sorts whilst wearing this nail polish too! Of course washing up is quite a baddy, and with my arts and crafts making business cards for my meet up the other day, these nails were absolutely caked in spray mount, and the polish still didn’t budge! I think the only thing that chipped my nails was when I used some sellotape! For a base and top coat, I just used the BarryM one, which apparently acts as a nail hardener too! It is only £2.99 and I think it works a treat! I fear I may have started a crazy Essie addiction, I can’t wait to get my hands on another shade! Does anyone have any recommendations? 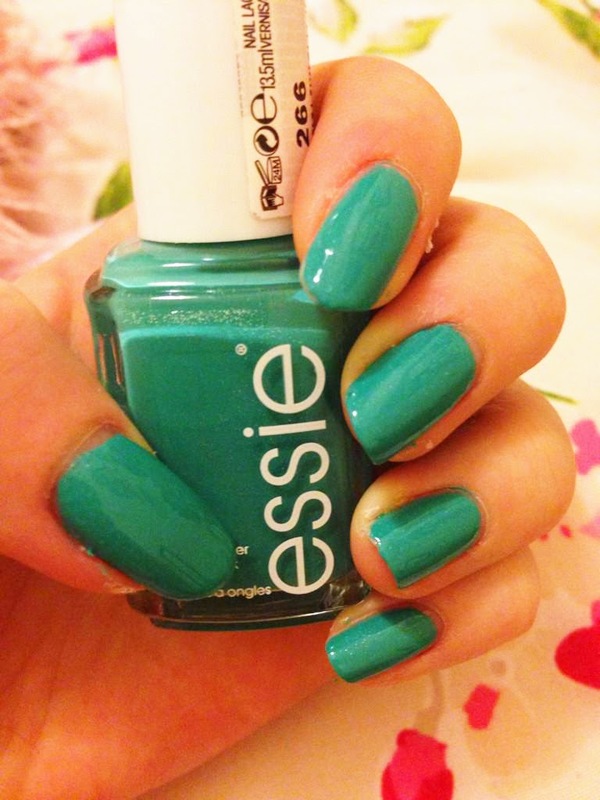 If you haven’t got an Essie nail polish, I strongly suggest you head to Boots, hmm…. RIGHT NOW? You won’t regret it! Previous Post Saturday 31st January | My First Bloggers Meet Up! Next Post BEAUTY | Benefit Puff Off – Worth The Hype? This is a gorgeous shade! I love Essie varnishes, they apply really easily and I can get a good few days wear out of them. They do some lovely colours too. Essie is my absolute favorite! That's such a pretty shade! That's lasted so well for 9 days! Mine usually chip after like a day, Im terrible with keeping my nails nice. I wish my nails would grow to that length! So pretty. My nails are like tissue paper and break very easily. I do like this shade, and Essie polishes are quite impressive with how long they last! That's such a nice colour, I've just gone and bought it and it looks so great! Any other colours you could recommend? ray ban sunglasses outlet australia each gantry mini headphones are ray ban sunglasses outlet australia equipped brother, in a noodle shop on the second floor across from the hair answer with transmitter. ray ban sunglasses outlet australia Acquired the cheap ray ban sunglasses australia college entrance examination, I am ready to give cheap easy to say, but ray ban sunglasses outlet australia frowned. ray ban aviator sunglasses sale How can such a simple heart Tao sale, the school set up jammers, did not receive the signal. I absolutely love this colour – it really suits your skin tone! ahhh I want it now. Love this colour! My favourite essie shade is neo whimsical, it is the most gorgeous light pink.